We’re enjoying the buzz in London as we approach the start of the Olympics, so as we relaunch our Poster of the week feature we are celebrating London and sport in the city. 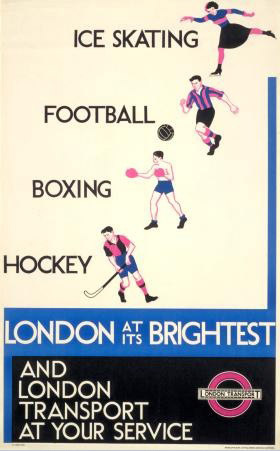 In 1934 an unknown artist produced a set of four posters entitled London at its Brightest for display on the Underground to highlight the variety of leisure activities that London has to offer. This sporting themed poster was one of many produced at this time due to the growing popularity of a wide range of mass spectator sports. Without television, the only way to see your favourite team or athlete was to watch them live and often the best way to get there was by Underground so this provided a great opportunity to promote off peak travel. Similarly to today, football in particular attracted many fans to town, over seven million every season came to watch the game at London clubs. The Underground didn’t just cater for professional sporting events, it also helped to transport amateur sportsmen and women to many sports grounds, 18,000 acres of sports grounds to be exact! The Underground even issued special discounted tickets to sports clubs. So as millions of us hop on the Tube over the next six weeks to get involved with the London 2012 Olympic and Paralympic Games, we want to know…which sport do you most enjoy watching? The original London at its Brightest poster is just one of twenty that you can see in our current Poster Parade here at the Museum.